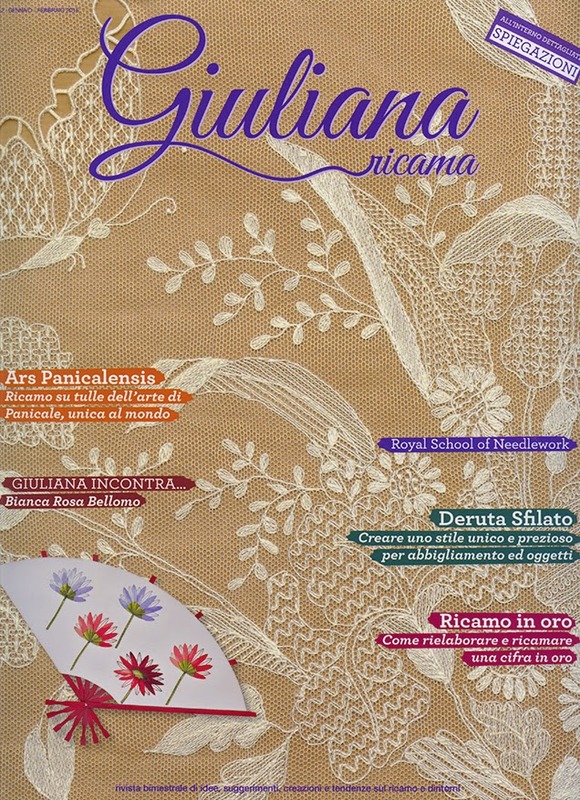 Last June I received an excited email from a friend in Verona with news that very soon a brand new embroidery magazine was about to come out with their first issue. My friend had met with and liked the people involved and was writing to tell me that she was sending me a copy. There was much excited buzz online about this new magazine when the first issue was released. It was different from all its predecessors and distributed only through needlework schools. Issue "0" was free of charge! 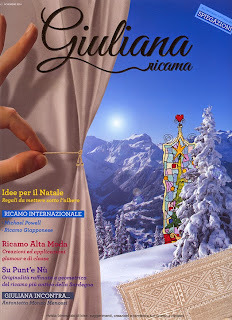 Issue "0" of Giuliana ricama, June 2014. Even before I received my copy I had lots of emails from Italian embroiderers asking if I knew about it, if I'd seen it yet, what did I think? Reviews were mixed. Some people were very enthusiastic, some less so. What I did hear loud and clear was that it was different from what people were used to - in every way. Change is good. The magazine had gotten people's attention and they were talking about it. Italian embroidery magazines have traditionally tended to be beautiful. High-glossy pages full of breathtakingly beautiful masterpieces. Sparse on instructions, mostly eye-candy. 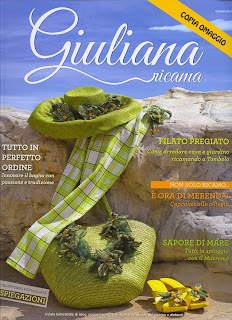 When my copy of Giuliana ricama arrived I tried to be impartial as I wanted to do a review on my blog. Large format (9 1/2" x 11 7/8") with perfect binding and a heavy card cover, it has semi-gloss paper inside and just over 100 pages. It's too big to fit in my scanner so I have to give you cropped cover pics. The macramé beach accessories on the cover interested me. The first page inside the cover had an advertisement that promised digital download for your smart phone or tablet, this also interested me. The letter from the editor asked for feedback, collaboration and ideas. There was a wide variety of projects: traditional embroidery, drawn-thread work, cross-stitch, macrame, crochet, bobbin lace, trapunto, reticello, punto antico, cutwork, huck-weaving, sicilian filet lace. Traditional projects like bed linens as well as fun things like t-shirt embellishment. Relatively simple projects, nothing that seemed like years of work. The magazine seemed to me to be aimed at young women or perhaps women with younger children. Personally, (and you know I'm interested in Italian needlework almost exclusively) while there were some Italian-needlework specific projects, I didn't think it would be a magazine for me mainly because of the level of simplicity and that I felt the projects were too "young" for me. However, when issue No. 1 came out and I saw the cover art online with Sardinian Punt'e nù embroidery, I was curious enough to ask a friend to send me a copy. 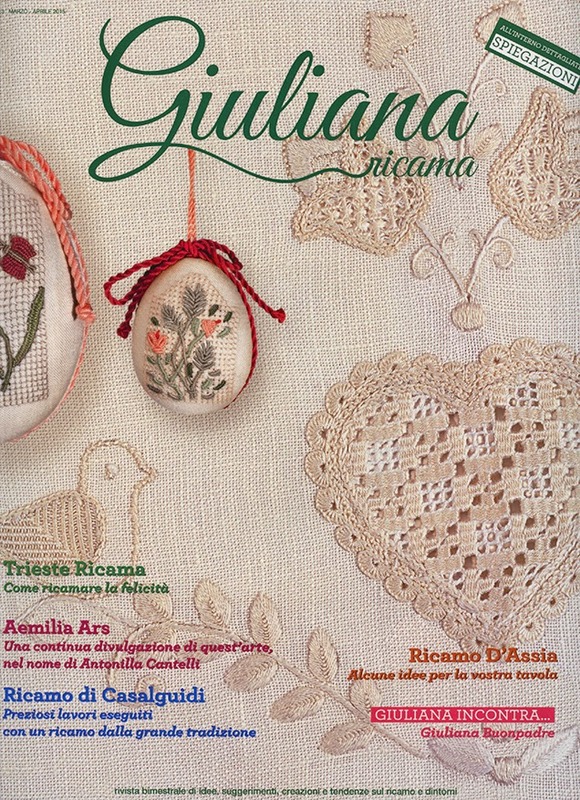 I was delighted to find that this new issue had a number of historical articles and an interview with one of the masters of Italian needlework. Issue no. 1 of Giuliana ricama, November 2014. I started to hear good things about the staff of the magazine from people who were meeting them at the various textile fairs and shows in Italy. Giuliana Ricama was not distributed on newsstands but through Italian embroidery schools. If you wanted a subscription, you had to do it through your local needlework school. I liked this idea, it meant that only those who were interested had exposure to it. The down-side to this of course is that all those people who embroider at home without attending schools don't see it on the racks of their local supermarket. But really, how often do you see needlework magazines on the racks anymore? Unfortunately this also meant that those of us outside of Italy could not subscribe. I was very lucky to have a friend gift me with a subscription but I feel incredibly guilty at the cost of overseas shipping every time I receive a new issue and imagine that my friend has other things to spend her money on, but I'm grateful nonetheless that she is making it possible for me to see this magazine. One thing I noticed immediately in this issue was that the ad promising future digital support was gone and I have since learned that they have decided not to pursue the digital subscription option. Issue No. 2 arrived and I was happy to see that the historical articles and interviews seemed to now be regular features. The range of ideas for projects was widening, this time there were things for those people who like to do historical re-enactment costuming. Step by step photos of stitch instructions were more elaborate and numerous than previous issues. There were some more-involved and technically-advanced projects too, not just simple quickies anymore, though small projects were still offered as well. Issue no. 2 of Giuliana ricama, February 2015. I have to say, having seen the cover art online, I couldn't wait for Issue No. 3 to arrive. This time I was inspired to stitch more than one of the projects. 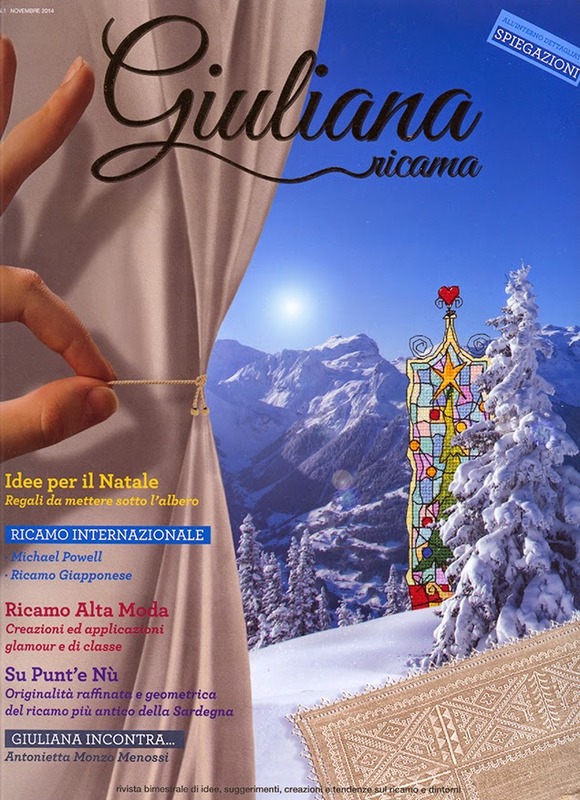 There was a subscription form in this issue which meant that if you lived in Italy, you could now get your issues delivered to your home instead of your local embroidery school. The letter from the editor continued to ask for feedback and collaboration and to point out that they were implementing reader suggestions in an effort to improve the magazine with each issue. I think they are doing just that - improving with every new issue. I saw the collaboration of various embroidery schools who seemed to be abundantly submitting projects. I for one, am looking forward to seeing what the next issue holds - changed my tune, didn't I? Issue no. 3 of Giuliana ricama, April 2015. When I was in Italy this past April, I went to their offices to meet with the editor-in-chief Marco and the sales manager Nicoletta. We sat in a room full of boxes of needlework that had been sent to the magazine for future issue projects. I may have peaked, but I'll never tell! The staff are very dedicated to the magazine and very much in need of support from anyone who is willing to submit projects, ideas and/or articles. Their interest is not limited to Italian needlework so this means that you can support them with any idea that you might have. Contact them here. They really do want to hear from you! Just so I've said it, the text of the magazine is in Italian. It looks like a fabulous magazine. I wish they'd sell it online. I too would like to be able to subscribe. There is a dearth of embroidery magazines in this part of the world too - must be fairly universal. We do have Inspirations which is good but a little too pretty for my taste and this one seems to have a wider range of techniques.